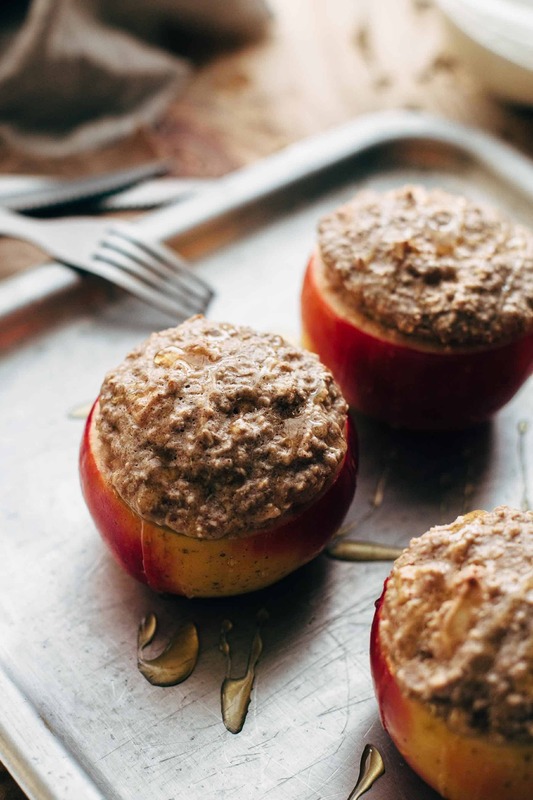 These Healthy Cinnamon Baked Apples are entirely free of refined sugar! Just 7 ingredients and 25 minutes of preparation. How have you been spending your holidays? Have you been eating tons of cookies and gingerbread and slurp eggnog all day long? I’m sure that sweatpants are made for feasting instead of exercising, don’t you think? No matter if we gain endlessly, holidays are just great. No work and much time for yourself and your family. Anyway, I’m your helper in need. In case that you don’t need to shop clothes one size bigger after the holidays or just live with sweatpants the rest of your life, I made healthy Cinnamon Baked Apples for you today to get you cured of your sugar trip. 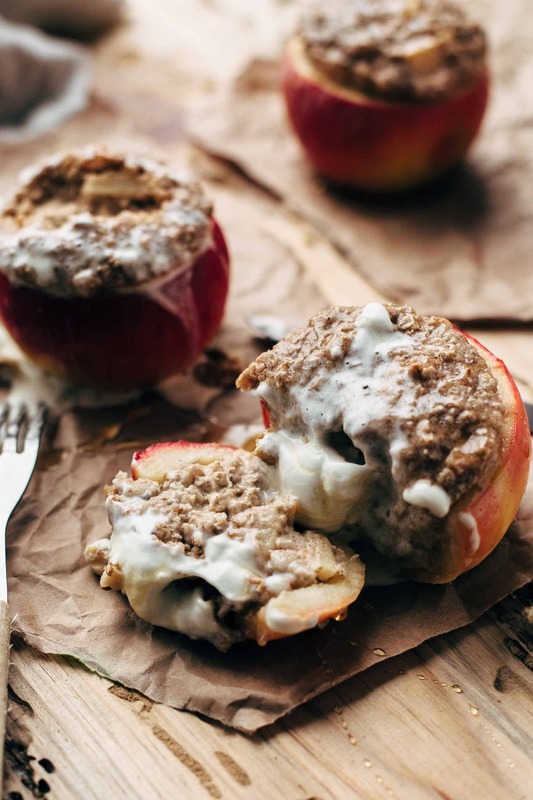 These healthy Cinnamon Baked Apples are sweet but come without any refined sugar. I sweetened the apples with just 1 tablespoon of maple syrup per apple. I also added one cut and peeled apple to the filling to get it even sweeter. But all natural. 1 full teaspoon of cinnamon and 2 vanilla beans add a bombastic flavor to the baked apples. The cream cheese adds a bit of a salty touch to the filling. The filling is beyond creamy. You can literally spoon the filling out of the apple. 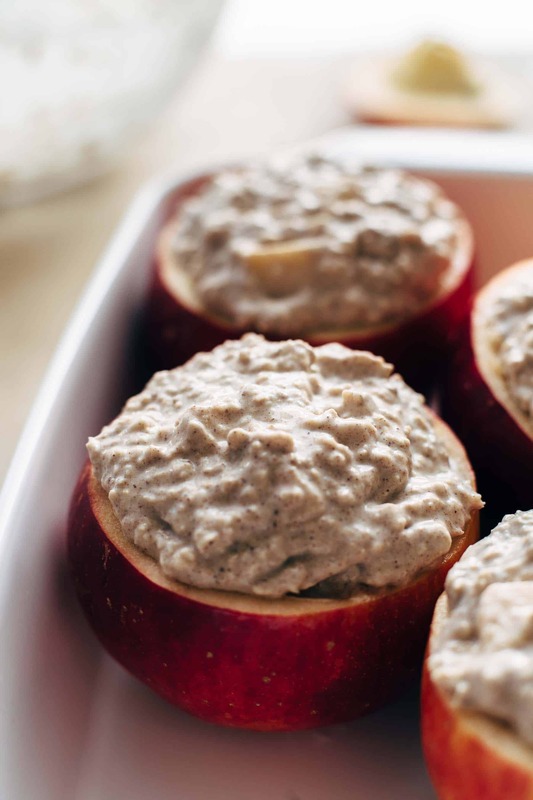 It’s like warm overnight oats in an apple instead of a jar. I had mine with one tablespoon of whipped cream and more maple syrup on top. Don’t judge me. I know we were talking about healthy Cinnamon Baked Apples and now I admit that I have mine with whipped cream? To my defense, one tablespoon of whipped cream doesn’t have that many calories, and I didn’t add sugar. 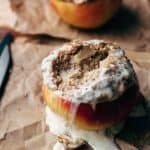 If you make this healthy Cinnamon Baked Apples recipe, leave a comment, rate it and tag a photo #alsothecrumbsplease on Instagram! Would love to see your snap! 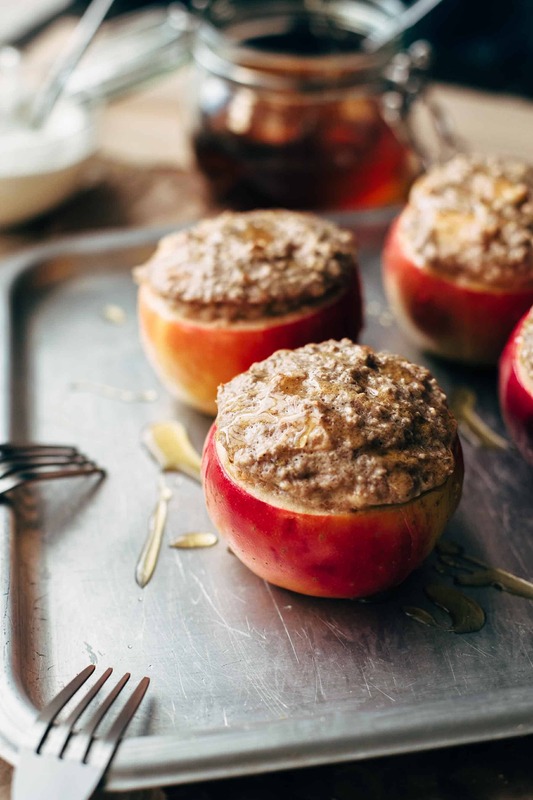 Click here to see all naturally sweetened recipes like Blueberry Cream Cheese Overnight Oats, Peach Cobbler Overnight Oats, Strawberry Rhubarb Overnight Oats, or Apple Pie Overnight Oats. 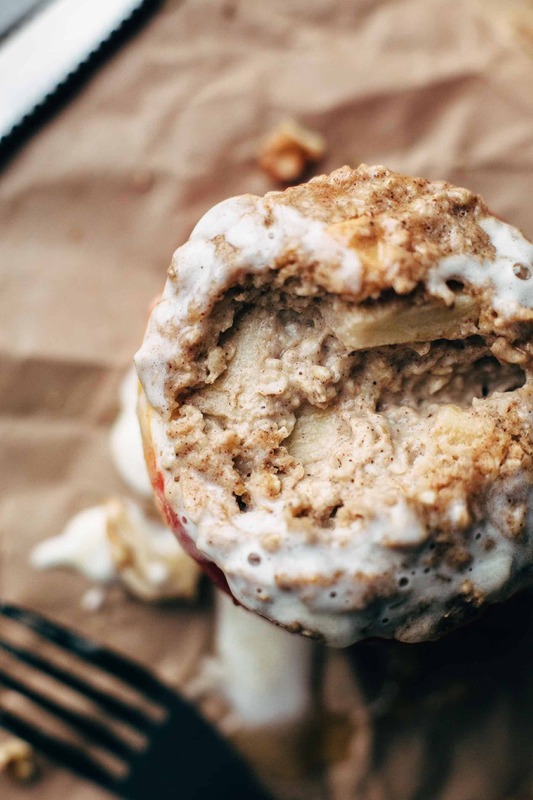 These Healthy Cinnamon Baked Apples are entirely free of refined sugar! Just 7 ingredients and 25 minutes preparation. Preheat oven to 400°F / 205°C. Peel and cut one apple into little chunks and place in a small bowl. Stir in 1/4 tsp of cinnamon. Set aside. In a large bowl stir together oats, cream cheese, milk, maple syrup, 3/4 tsp of cinnamon, and vanilla* to combine. 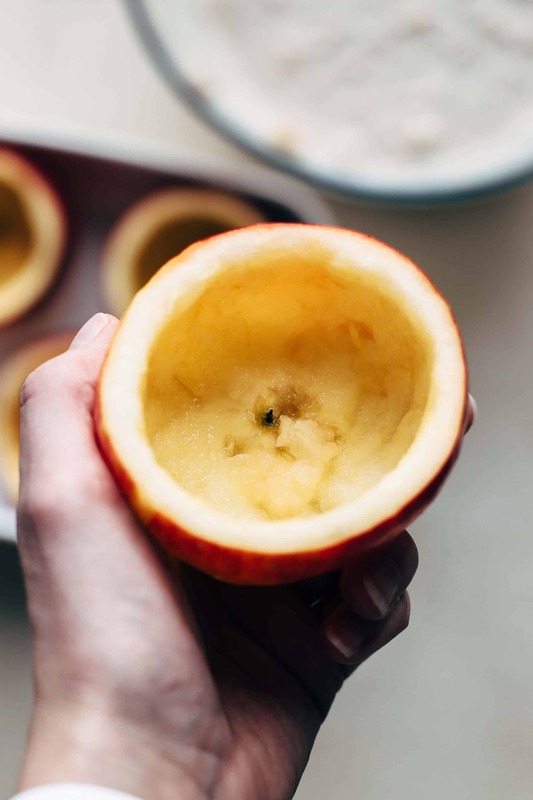 Cut off the top of the remaining 4 apples and hollow out until the apples have about 0.5-inch thickness. Spoon filling inside the apples and place on a baking sheet or in a baking pan and bake for about 18-20 minutes. Top with whipped cream, maple syrup, or chopped nuts, and serve immediately. 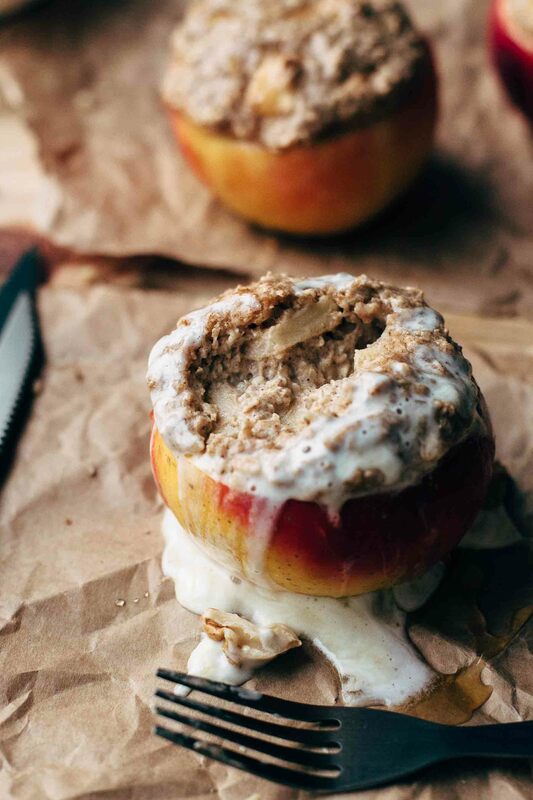 I have never seen anything like these stuffed apples before, this looks so good! what a creative recipe! I have to try this! Thank you so much, Albert! Nothing beats a healthy though sweet dessert without any refined sugar.